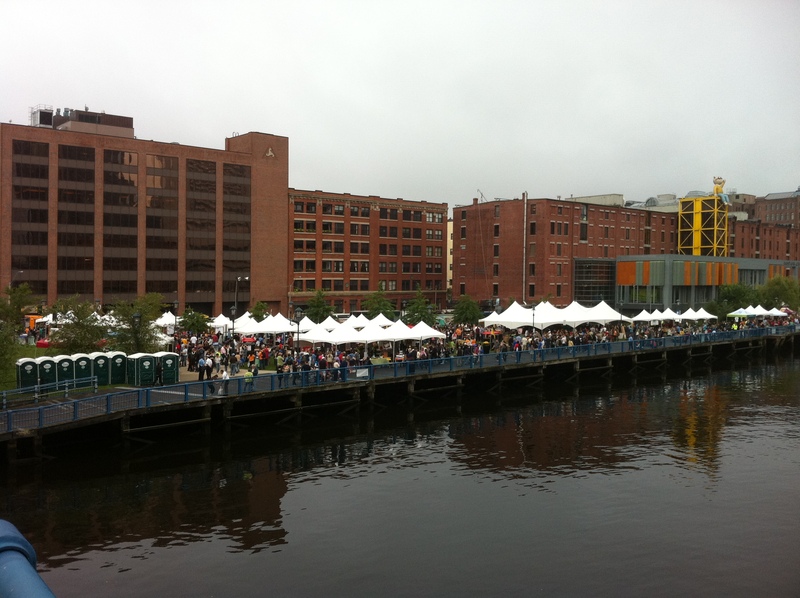 This Saturday, the threatening rain couldn’t keep me away from the Boston Local Food Festival. A glowering sky and morning showers gave way and while the sun only broke through in brief patches, the morning chill did dissipate. I hopped on the Red Line and got off at South Station, and then promptly proceeded to the Children’s Museum, site of the Food Festival. From afar, I glimpsed a white sea of dots–the vendor and demonstration tents–but it wasn’t until I entered the festival grounds that I realized the (impressive) magnitude of the event. The Food Festival, in its second year, is one of the SBN Local Food Committee’s seven initiatives aimed at growing the local and regional food system. Upwards of one hundred vendors were offering samples and selling their products; local chefs and butchers gave culinary demonstrations; nonprofit organizations disseminated materials and information; local bands serenaded.